It’s not summer yet. No matter how I parse it, 50 degrees and fiercely windy does not a summer day make, even here in the Frozen Tundra. My pepper and herb plants are sleeping indoors at night, since there’s still a risk of a hard frost. 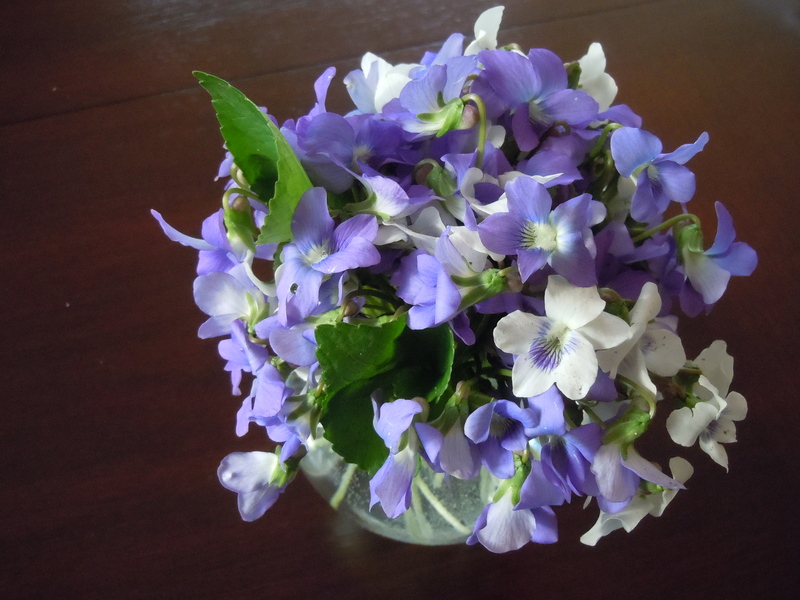 But the violets have been blooming for a few weeks. 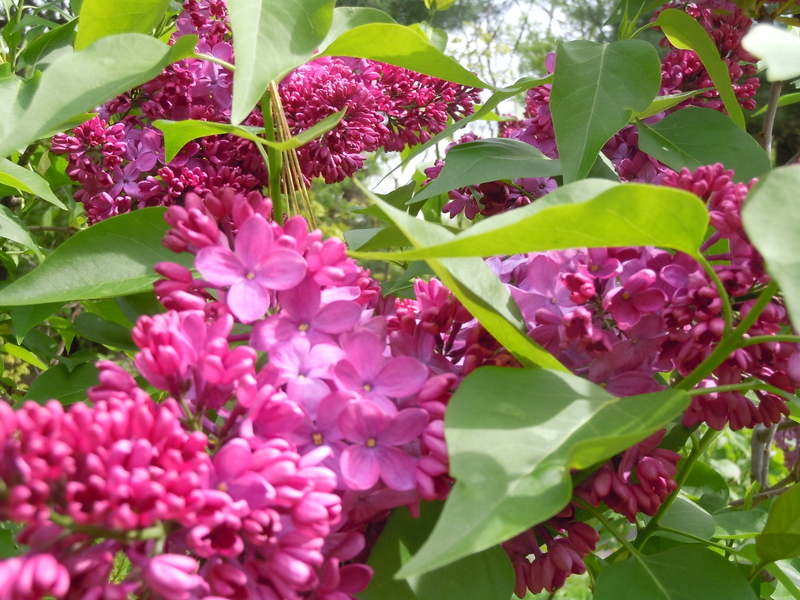 I’m knocked sideways by the scent of the lilacs when I walk to the end of the drive to get the mail. 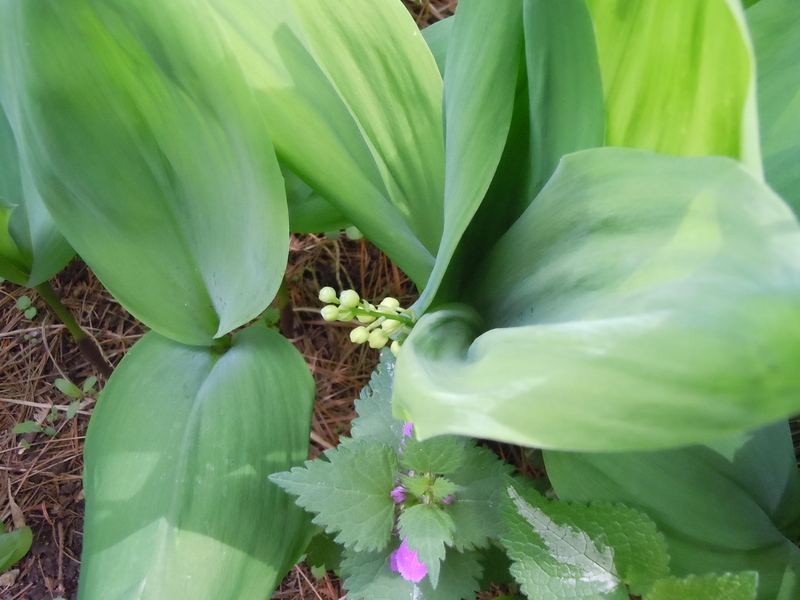 And overnight the lilies of the valley have sprouted wobbly stalks with fat green buds. Within a few days, our house will be filled with flowers. Still, Luke doesn’t play his first soccer game of the season until next weekend. Fair warning, Wisconsinites: it almost always snows on opening day. Just so you’re prepared. I’m taking the glass-half-full approach and making our favorite summer salad. In real summer (as opposed to wishful-thinking summer) it starts with a handful or two of tomatoes still warm from the sun, and a small bouquet of basil, parsley and chives snipped from the pots on my deck. Off-season, I use grape tomatoes. I’m already blowing my chance of winning locavore of the year with the avocados anyway. The plan is always to serve this salad with dinner. It rarely makes it to the table. It’s best if it’s made an hour or so ahead of time, but Tom and I can’t resist nibbling it as we prepare the rest of dinner. It’s part salsa, part guacamole, but creamier and richer than salsa and lighter and more refreshing than guac. (You know to use those nubbly black-green Hass avocados, right?) The bare-bones version has only tomatoes, avocado, and a scallion or two, seasoned with a drop of balsamic and a drizzle of olive oil. Sometimes I add a smidgen of mashed garlic, a bit of diced red pepper and some fresh herbs, and of course a minced Fresno, because I just can’t get enough of those sweet-hot babies. Anything you add must be a supporting player, there to bring out the best in the stars. 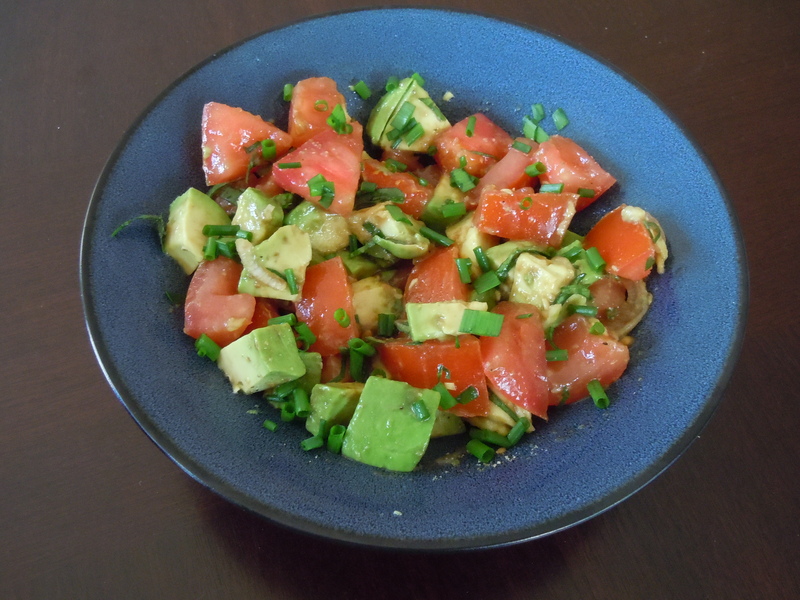 However you make it, tomato-avocado salad brings summer right to your table. Gently stir everything together. It’s best if you let the salad sit at room temperature for an hour or so, but it’s still delectable if you can’t wait that long. It’s also perfect piled on corn chips, or as a topping for tacos, or tucked inside an omelet, with or without cheese. (Who am I kidding? I never choose “without” when it comes to cheese.) And it’s irresistible spooned right out of the bowl. 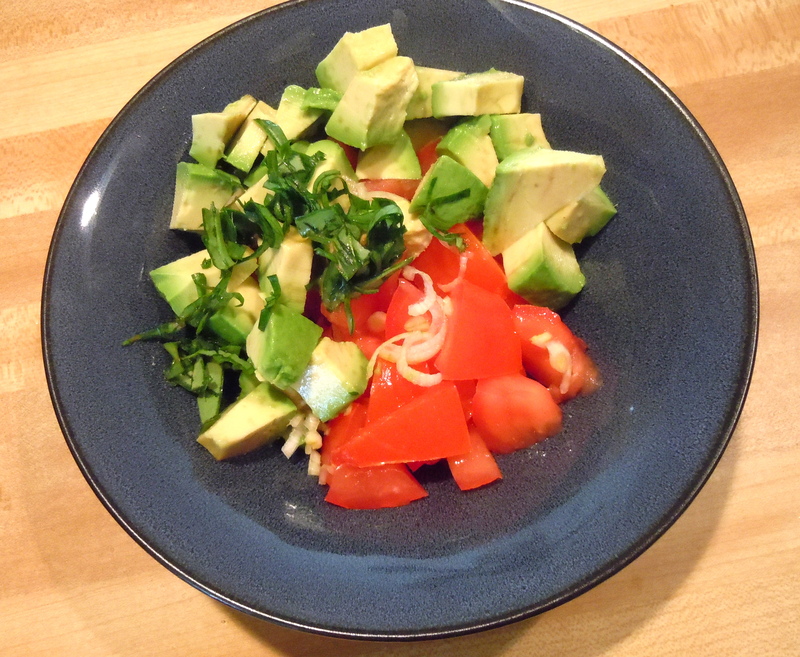 This entry was posted in sides, veggies and tagged avocado, tomatoes. Bookmark the permalink.